Wrap your wrist in style with our gorgeous piece of vintage design bangle. Since a zircon embellished bangle is a versatile piece, you can wear it on any occasion. This bangle features a delightful sparkle that will captivate on lookers. Jewellery Care: Avoid contact with perfume, hairspray, chlorinated water, salt water or household cleaning products. Always protect your jewelry from sharp blows, scratching on abrasive surfaces and chemicals. Wrap your wrist in style with our gorgeous piece of vintage design bangle. Since a zircon embellished bangle is a versatile piece, you can wear it on any occasion. 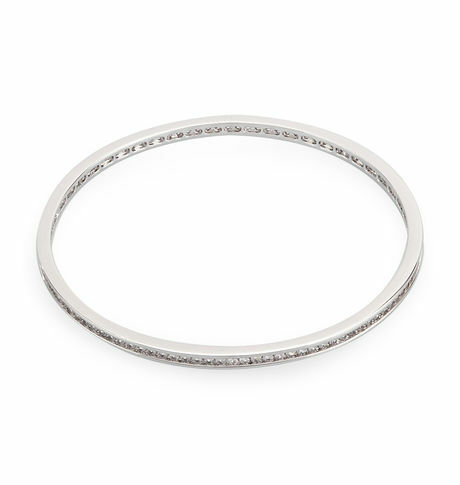 This bangle features a delightful sparkle that will captivate on lookers.Rhodium finish ColorSilverBase Material Brass Clear Cubic Zirconia StonesJewellery Care: Avoid contact with perfume, hairspray, chlorinated water, salt water or household cleaning products. Always protect your jewelry from sharp blows, scratching on abrasive surfaces and chemicals.Cancellation and Return Policy: • Exchange allowed post booking • No order cancellation or Refund transaction allowed at the store.